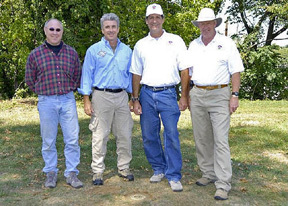 The predecessor of the Highpointers Foundation was an account, known as the Good Guys & Gals Fund. 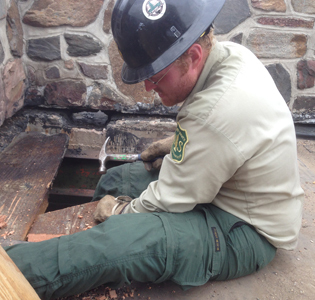 This evolved to include assisting state highpoints, primarily privately owned, with expenses for maintenance and upkeep. 2015 - Amount of financial assistance: $12,500 with a commitment of $40,000 for the remaining three regions in the coming year. We are seeking major corporate and private foundation sponsorship. The Highpointers Foundation is committed to funding films on state highpoints and Highpointing, beginning with the Northeast Region, a film that was completed in 2016. The films will be featured in the Golden, Colorado BWAMM film room, and be made available at no cost to educational institutions for geography and other suitable classes. 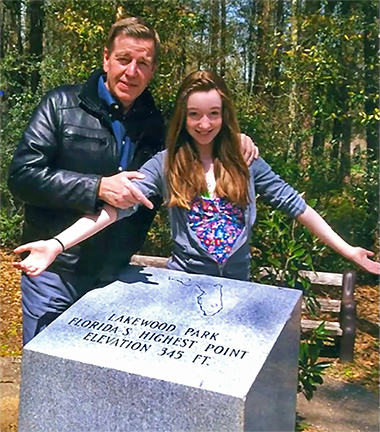 The Foundation is also helping to raise money for a feature length film on Highpointing called American Highpoints by Every Step Productions. It is the first film dedicated to the highpointing passion and strives to answer the question Why Highpointing? 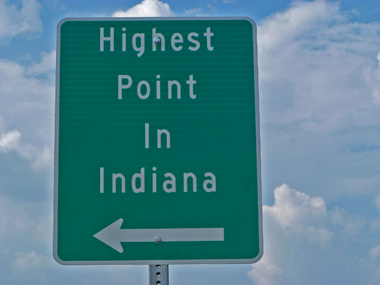 The Highpointers Foundation is funding a series of Highpointing films in the major US regions. EveryStep Productions is producing four films. 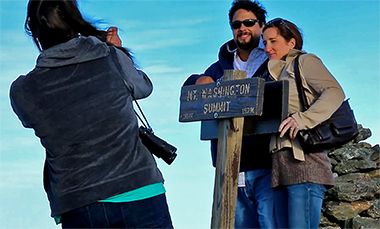 The first film about the Northeast Region is complete, and you can view it on Vimeo. To watch the movie, click the photo or link below. To watch the movie, click the photo or link above. 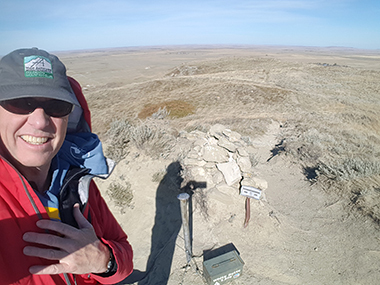 Approaching WY’s highest, 13,804-foot Gannett Peak. 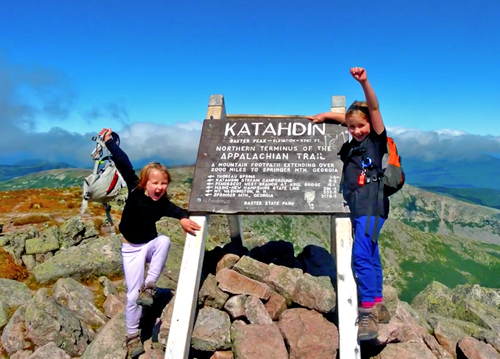 Maine’s highest, 5,268-foot Mount Katahdin. Highpointers Trailer from EveryStep Productions on Vimeo. 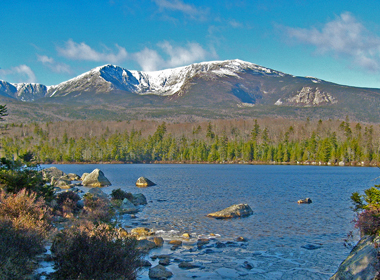 the famous 6,288-foot Mount Washington. On April 12, 1934, a wind speed of 231 MPH was recorded at Mount Washington’s summit. and is still the Western Hemisphere record. 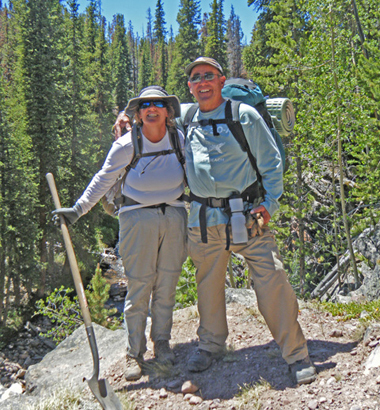 Good Day DC Interview with Gary and Mackenzie Scurka of EveryStep Productions on Vimeo. 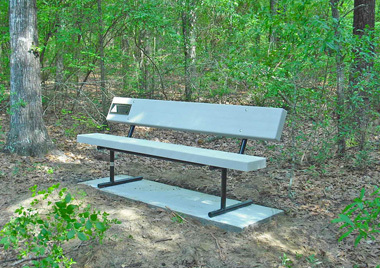 The Highpointers Foundation has committed to purchasing two dozen modern benches made from recycled plastic. 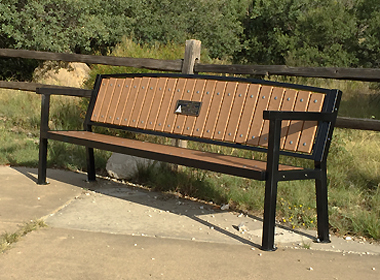 Built with a black steel frame and pleasant earth-tone tan colored planks, these environmentally friendly benches are being placed at highpoints all over America for weary visitors to stop, pause, and admire the vista. 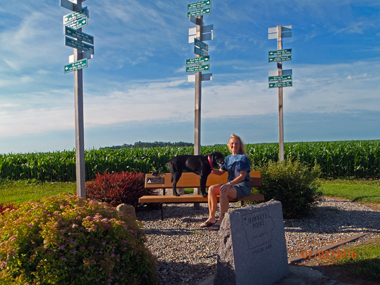 Strategically placed to maximize viewing and resting, these benches can be seen in numerous highpoint locales. 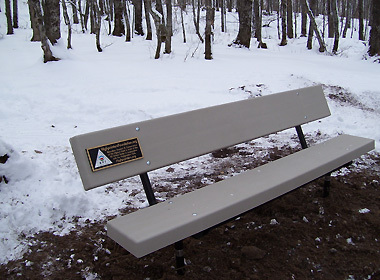 The benches are each six feet long, and made by Kirby-built of New Berlin, WI, one of Americas leading providers of environmentally friendly trailhead equipment. 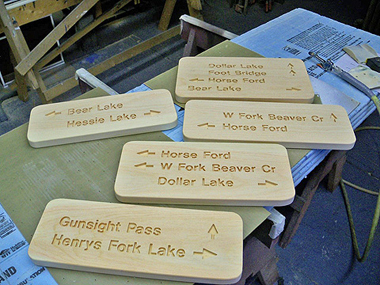 Visitors may see some kiosks, info boards, signposts, and other items soon, all made by Kirby-built. 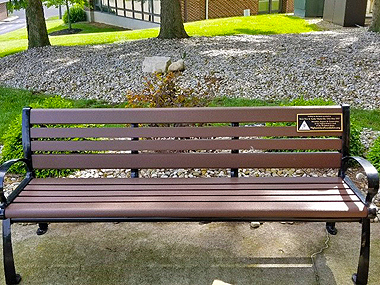 Thirty benches are currently installed as of summer 2018, with 3 more planned in 2019. The Bench Project offers opportunities for visible cooperation between the Foundation and managers/owners of the various state highpoints. 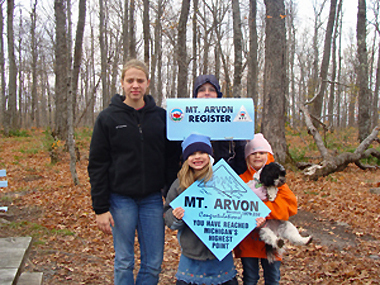 It also provides an awareness to the public that maintaining and improving state highpoints is a continuing effort and process in which everyone can participate. 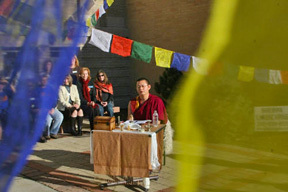 Donors are needed to help make this project a reality. 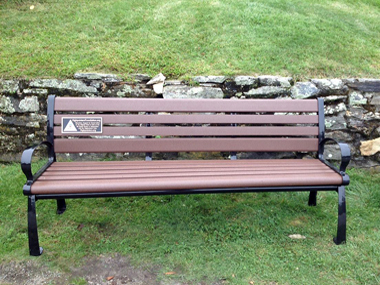 A custom plaque will be created identifying major sponsors, and imbedded in the backrest of the bench. 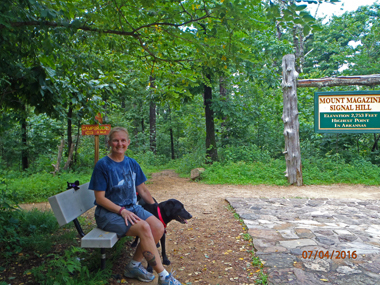 Please consider sponsoring a bench at your favorite highpoint! 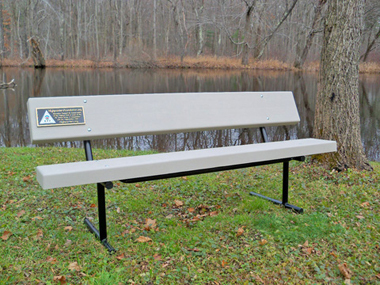 a custom plaque will be created identifying you, and imbedded in the backrest of the bench. 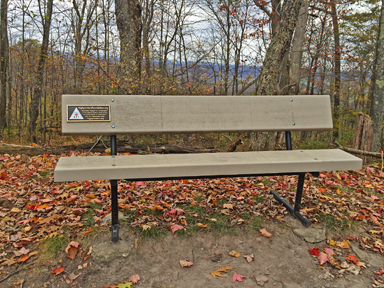 Please consider sponsoring a bench at your favorite highpoint! 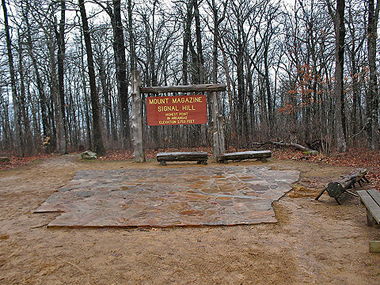 The Highpointers Foundation provided two benches and an information kiosk on Magazine Mountain plus a trailhead registration box. 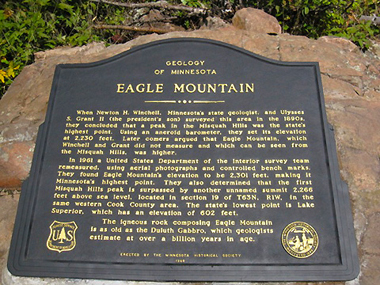 During the 2018 convention, the Foundation installed a large new sign at the summit to replace the one that was recently vandalized. 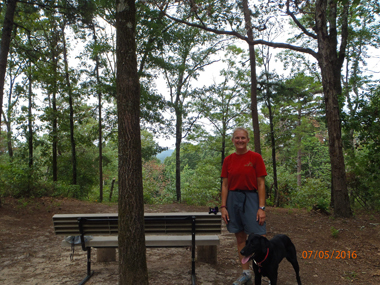 Terri Rowe and her dog Luna on the two benches at the Arkansas Highpoint. 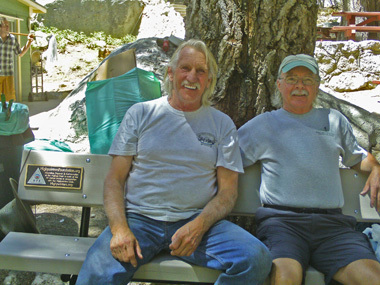 The Highpointers Foundation provided two benches near Mount Whitney. 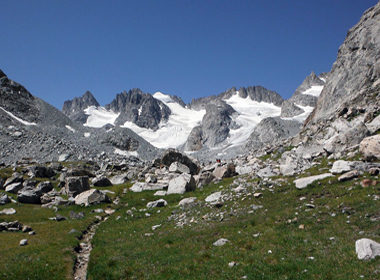 One is at Whitney Portal, where hikers can tie their boots before setting off. Another is in Lone Pine near the hostel and store. in the Lone Pine store. 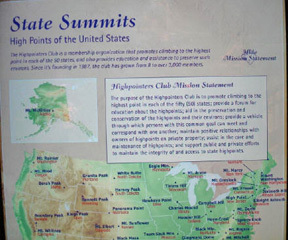 The Highpointers Foundation provided funds for the creation of a state highpointing exhibit at the new museum, located at the American Mountaineering Center in Golden. 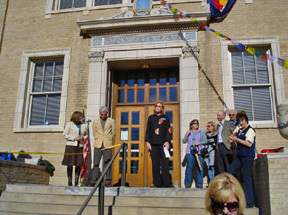 This building houses the Colorado Mountain Club, the American Alpine Club, Outward Bound, Colorado Trail Foundation, Fourteeners Initiative, and other smaller non-profits associated with the mountains. 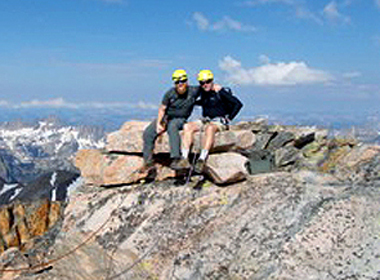 The museum, the only one of its kind in North America, has a large exhibit hall dedicated to all facets of mountaineering – including Colorado peaks (with the Fourteeners), other American peaks, peaks from around the world, sacred peaks, and a history of mountaineering. 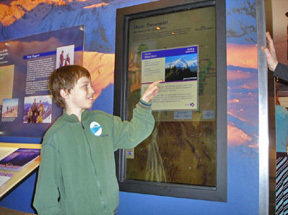 The highpoint exhibit is currently featured as a touch screen interactive display, where visitors can explore their own state highpoints as they pass through Colorado on vacation, with text describing the highpoint and its environs and history, plus photographs. The Highpointers Foundation is committed to assisting the BWAMM in further maintenance and development efforts of the state highpoint exhibit. 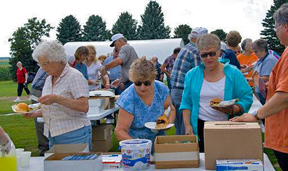 The Foundation hopes to be able to contribute to the BWAMM on an annual basis. The donations for this initial expenditure were provided by the Paul Zumwalt Museum and Education Fund. 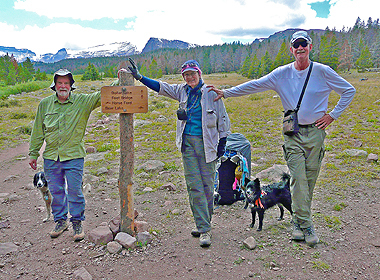 The late Paul Zumwalt was a surveyor and hiking guidebook author who, along with Jack Longacre, was committed to creating a museum for highpointing that could someday provide educational assistance to bring the world of highpointing to a broader audience. This Fund was un-used for many years after the passing of both men, until it was determined that the best use of these funds would be to direct the funds, via the Highpointers Foundation, to assist in the creation of an exhibit at the BWAMM. Funds are being set aside for a future project at the BWAMM involving tangible historical highpointing artifacts. 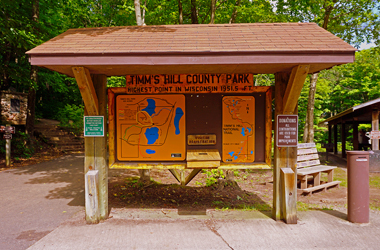 Another project under consideration is a short movie highlighting the 50 state highpoints, to be shown in the BWAMM theater. 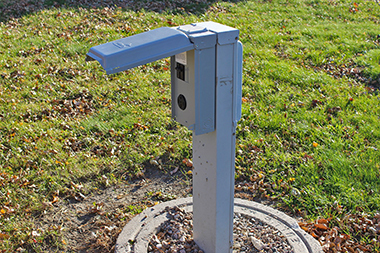 Users enter, push a button, and can sit and watch movies there. The 50th anniversary of the first climb of Mount Everest brought together great alpinists who played a major part in Everest history. 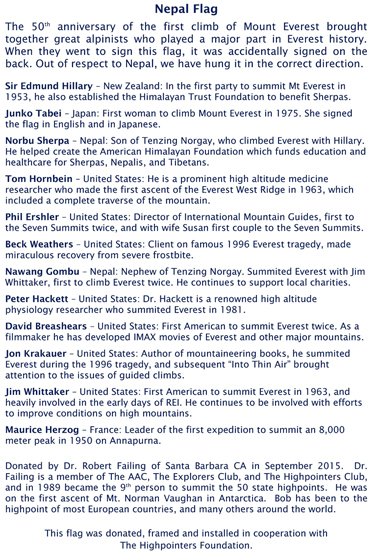 The following climbers signed this Nepal Flag: Sir Edmund Hillary, Junko Tabei, Norbu Sherpa, Tom Hornbein, Phil Ershler, Beck Weathers, Nawang Gombu, Peter Hackett, David Breashears, Jon Krakauer, Jim Whittaker, and Maurice Herzog. 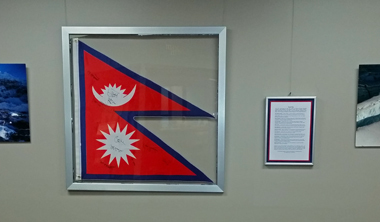 A donor gave the Highpointers Foundation money to have the flag mounted, framed, and placed on a wall in BWAMM, where it resides today. 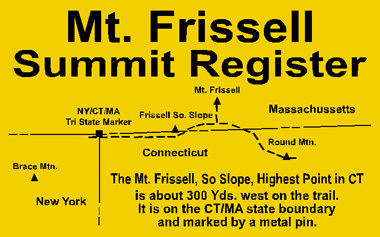 The Highpointers Foundation provided funds for a register and sign on the summit of Mount Frissell that provide directions to the Connecticut Highpoint on the southern slopes of Mount Frissell. 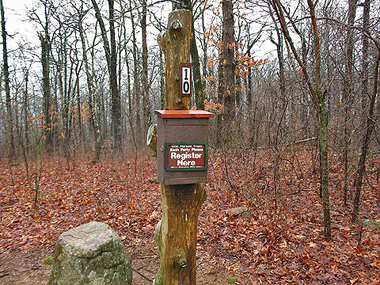 A register was also placed at the Highpoint. 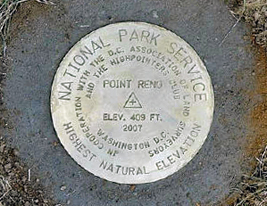 The Highpointers Foundation provided funds for a benchmark placed by the Washington D.C. Surveyors Association after the highest natural ground of the Federal District was properly surveyed and established in 2007. 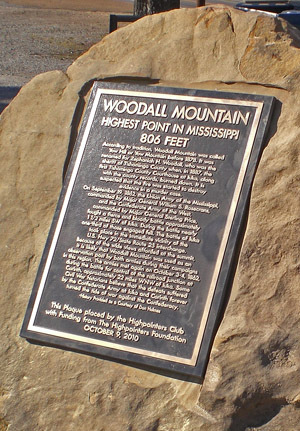 There was a dedication ceremony in April 2008, and the highpoint became officially known at that point. 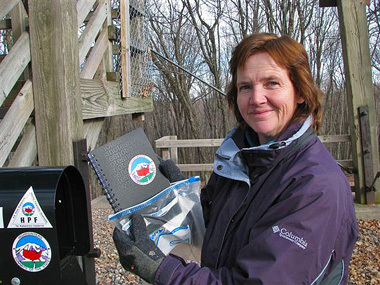 The National Park Service is cited right on the benchmark as the owner, with an acknowledgement to the Surveyors Association. 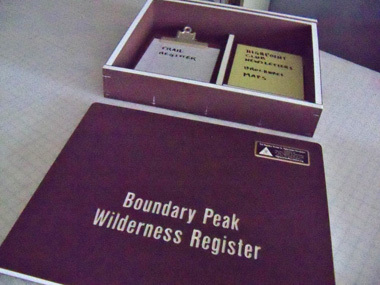 This was the first collaboration between the Highpointers Foundation and another organization for the benefit of a highpoint and for the benefit of the National Park Service. 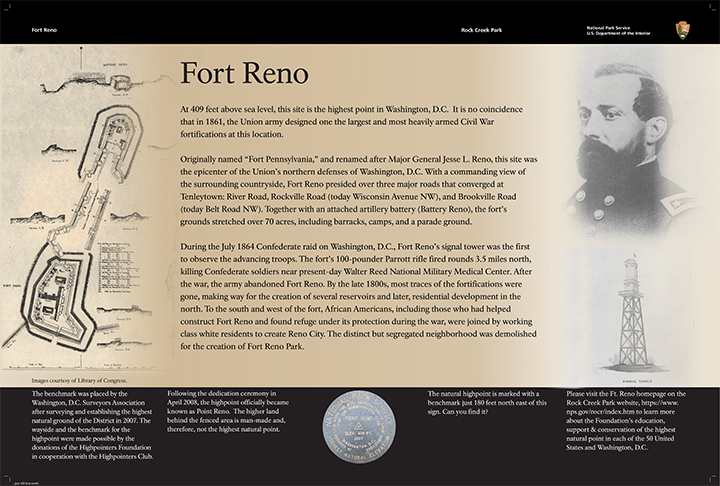 The Highpointers Foundation is working with the National Park Service to create an interpretive sign to alert visitors to the significance of Point Reno as a state highpoint and to assist them with directions to more easily locate the hard-to-find benchmark. The National Park Service interpretive sign. 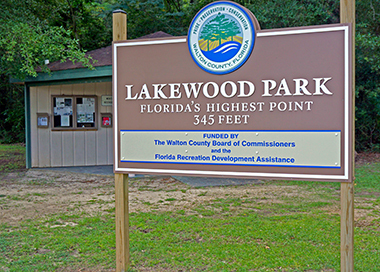 The Highpointers Foundation provided funds for two benches and a kiosk that were placed on Britton Hill close to the Florida Highpoint. 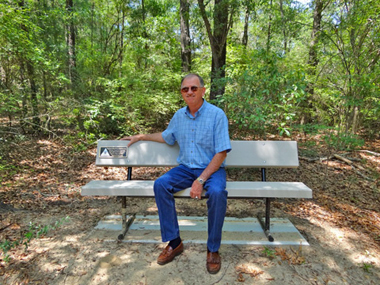 Walton County Commissioner Kenneth Pridgen visited the highpoint to enjoy a bench. 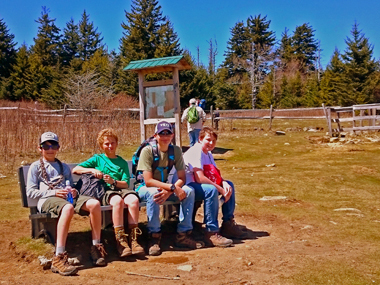 The Highpointers Foundation provided funds for two benches and an information kiosk that were placed on Brasstown Bald. 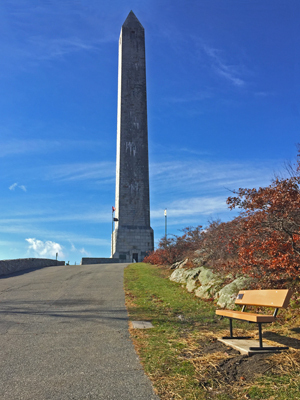 One bench is on the observation deck, providing rest and views. 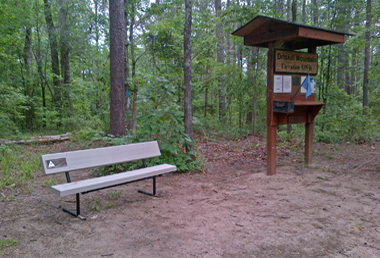 The second bench is at the upper shuttle stop where weary vistors can await their transportation to the parking area below. 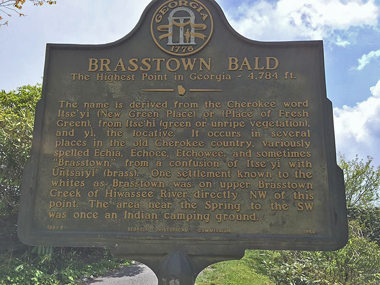 The information kiosk is on the wall on the breezeway educating visitors about the importance of Basstown Bald and other state highpoints. 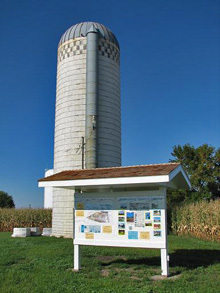 The kiosk also advises highpointers to check with visitor center staff to gain access to the true bencmark, which is set in bedrock beneath the building. 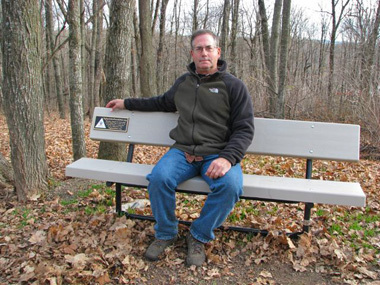 The benches were installed by Pam and Julie from Friends of Brasstown Bald with USFS employee Lorne Cosner (pictured). 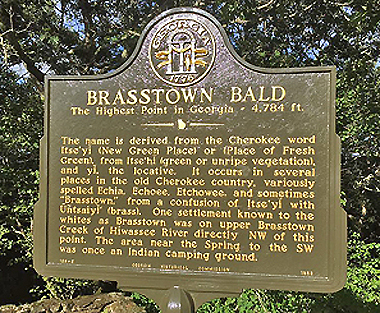 The Highpointers Foundation worked with the Brasstown Bald management to pay for the refurbishment of historical metal signs, a project that is now done. 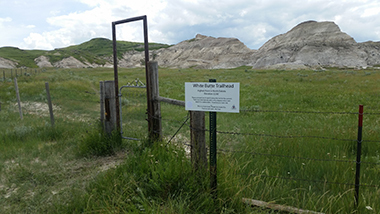 We are also working to create new interpretive signs alerting vistors that they can indeed visit the actual benchmark behind a locked door, if they ask at the front desk inside. 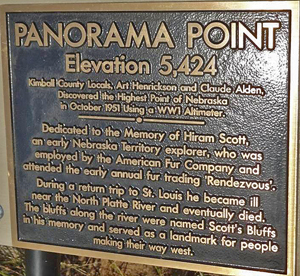 We also paid for scenic vista signs around the observation deck that identify the distant hills and mountains. 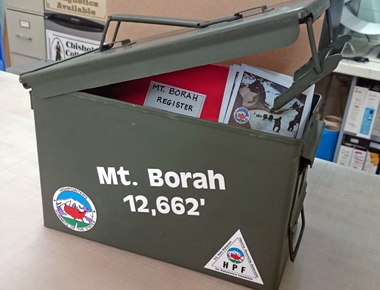 The Highpointers Foundation has provided funds for an ammo box register that will be placed on the summit of Mount Borah in 2017. 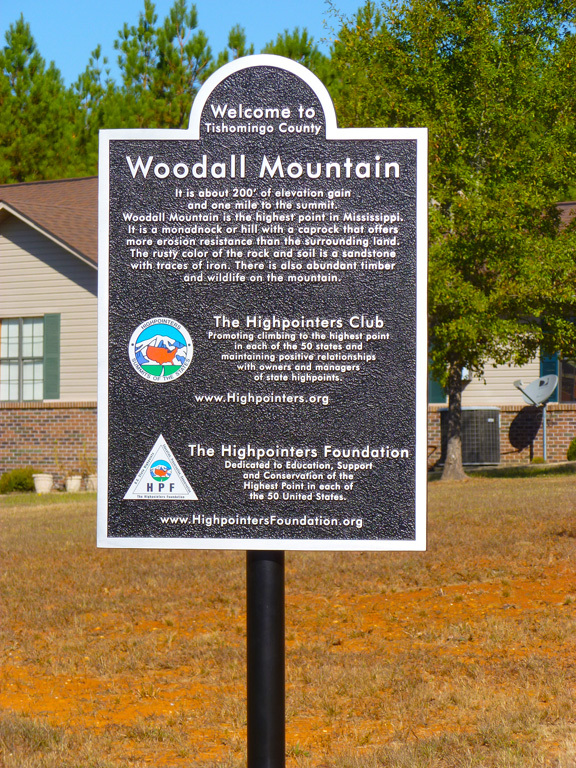 The Highpointers Foundation has provided funds for signs leading visitors to the highpoint from the local road. 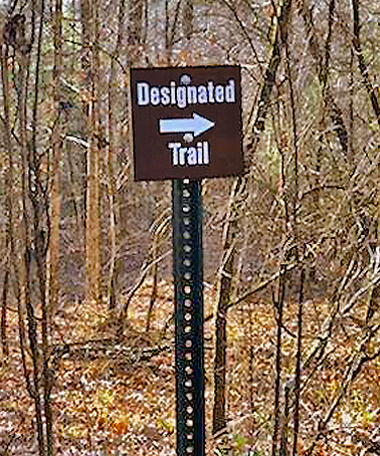 These signs, developed by the Renaissance Signs firm of Gonic NH, employ theft-resistant bolts to deter vandals. 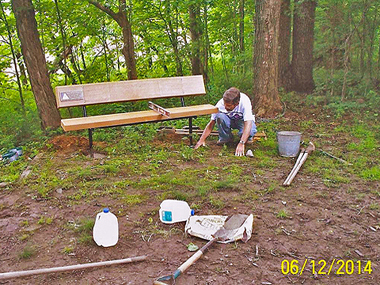 Previous work by an Eagle Scout is being supplemented by new improvements from the Foundation, including a bench, and possibly a picnic table and info kiosk to come. 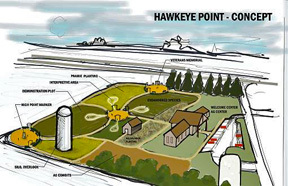 The Highpointers Foundation is committed to provide funds for a major renovation at Hawkeye Point. There has been active work to foster a relationship with both the private property owners, and the local Osceola County government. 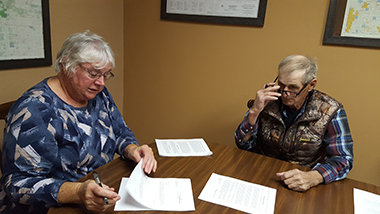 In 2007 an agreement was reached whereby the Sterler family, owners of the farm for many decades, would donate the actual land at the highpoint to the County, and would sell the remaining several acres of the surrounding farm houses to the County. 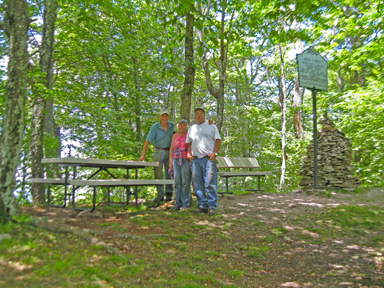 This agreement was realized in April 2008, and the County now has taken possession of the highpoint. County agencies will occupy the building on the location to help offset the purchase price, and state funding is being sought to assist in a visitor center. The Foundation has committed to assisting with this process. 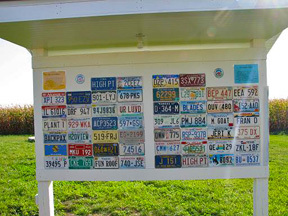 An informational kiosk has been built near the highpoint, and the old license plate display is on the back side of it. A flagpole has been erected. 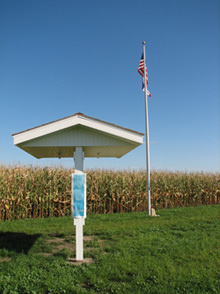 Five tall posts have been erected with 10 signs on each, indicating the distance and direction to other US highpoints. Major landscaping around the highpoint and the house has been completed. Much of this has been paid for by the Foundation. 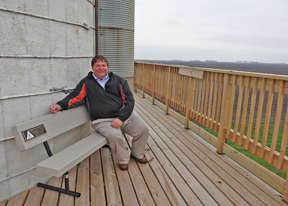 An 18-foot high observation platform has been built around the old corn silo. 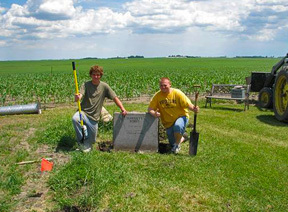 is a tradition at the Iowa Highpoint. 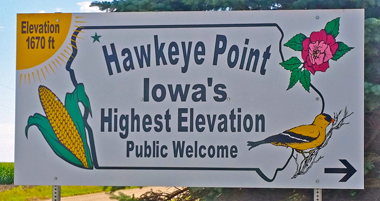 The highway which passes close by to the west of Hawkeye Point was recently upgraded to a major 4-lane highway, and the corridor now draws a substantially higher volume of traffic than in years past. 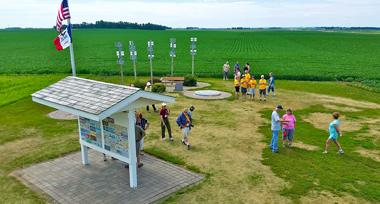 A visitor center would bring many in for a stop. 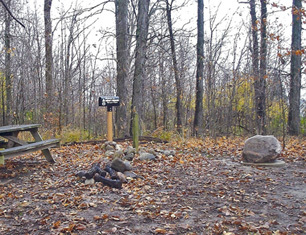 A seven acre plot of wooded land immediately north of the highpoint has been purchased from the state of Iowa Highway Department for a campground as well, and initial development occurred in 2011-2015. Brush has been cleared, and gravel laid for camping and RVs. 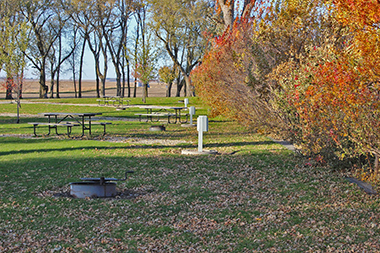 A bathroom with showers and a picnic pavilion was completed in summer 2015. 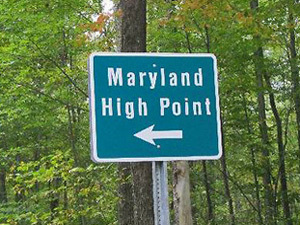 Weary travelers can now find a place to stay next to the highpoint, perhaps one of the few locally owned highpoints in America where overnight visitation is allowed this close to the actual highpoint. 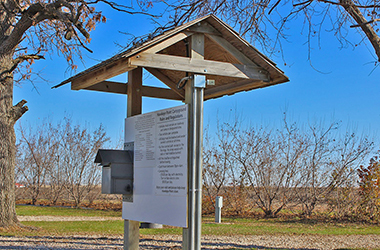 The Highpointers Foundation provided the majority of funds to acquire and develop this acreage. 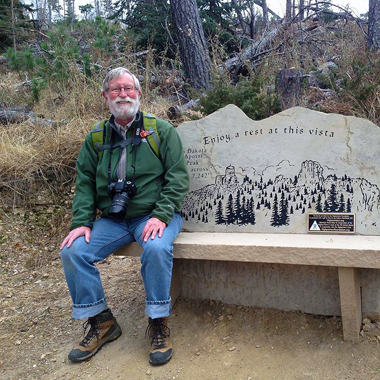 Mike Earll at the benches near the highpoint and on the silo deck. 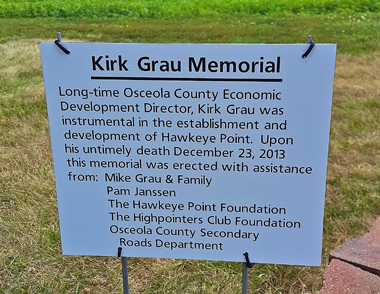 The Highpointers Foundation also helped to memorialize Hawkeye Point Foundation Creator Kirk Grau, who passed away in 2013. 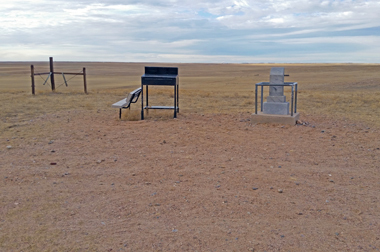 The Foundation also funded the creation of the 50 state mileage markers that are mounted on five posts and denote accurate distances to the other state highpoints. 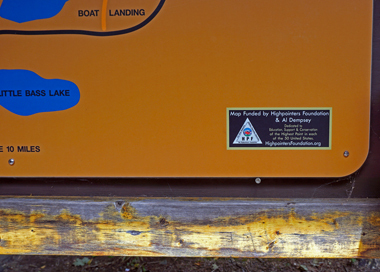 In 2018, the Foundation sponsored the upgrading of the electric outlets to 50 amps at the adjacent Campground. 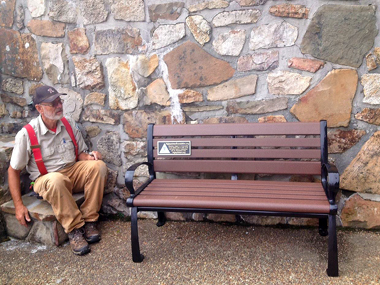 The Highpointers Foundation has provided two benches for visitors, one at the highpoint and one at a view site. 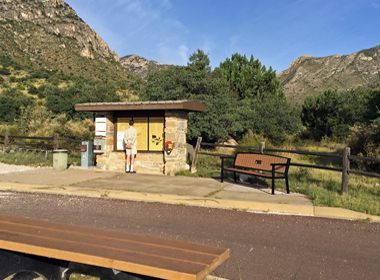 In cooperation with the land owners, we have placed an information kiosk at the highpoint. The LA HP owner reached out to the Club for assistance due to concerns over visitor Safety. Some hikers had been straying off of the road onto alternate paths, and local hunters were not expecting this. 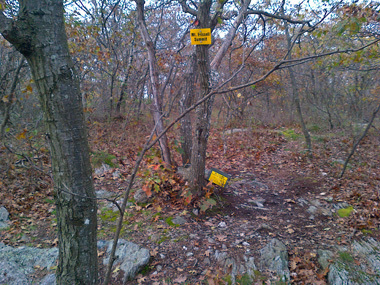 The HPF provided signage advising hikers to stay on the trail, and to wear Blaze Orange during hunting season in late Fall. 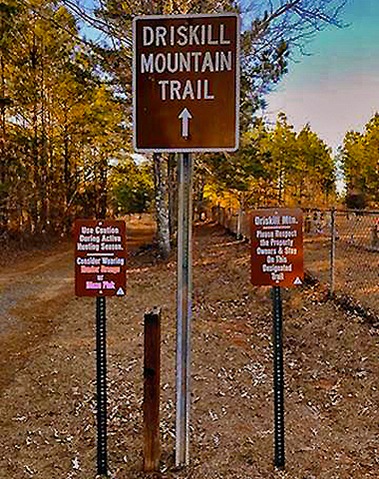 The signs were installed in January 2018. 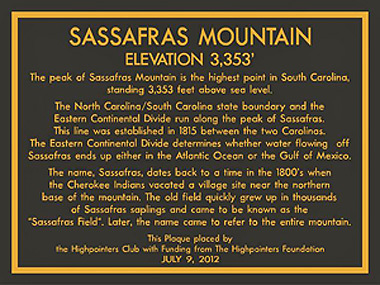 The Highpointers Foundation provided funds for signs leading visitors to the highpoint from the highway and along the summit ridge. 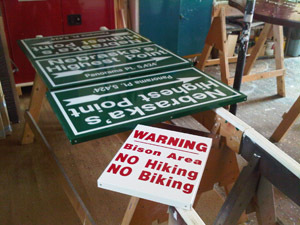 These signs, developed by the Renaissance Signs firm of Gonic NH, employ theft-resistant bolts to deter vandals. 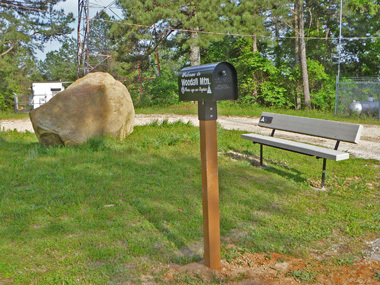 A register mailbox and bench was added in 2012. We replaced the old wooden picnic table with a new one in 2017. 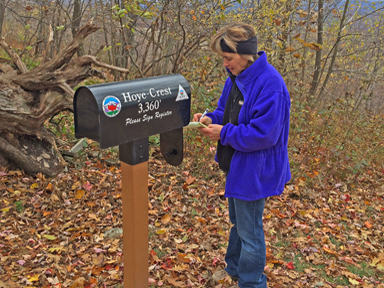 The Highpointers Foundation provided funds for a new register mailbox to be placed at the summit area, along with custom trail signage and a new summit sign. 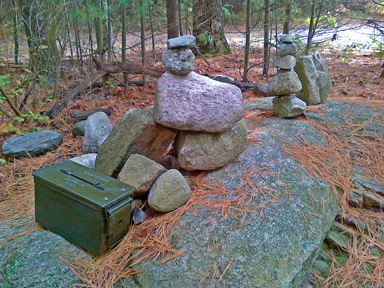 This was placed in the Fall of 2011. 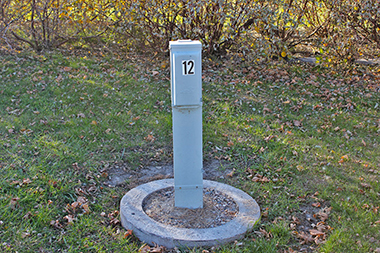 Theft-resistant bolts were used to discourage vandals. 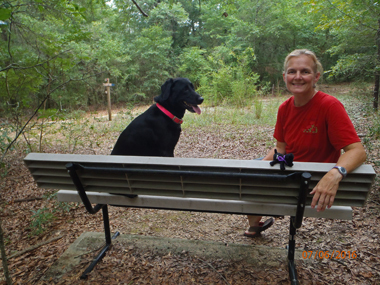 With additional funds we are now able to provide a new bench, picnic table, etc. 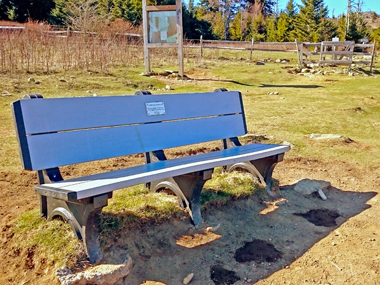 We reached an agreement with the local authorities to place a bench at the recently cleared view spot, located a hundred yards north from the highpoint. 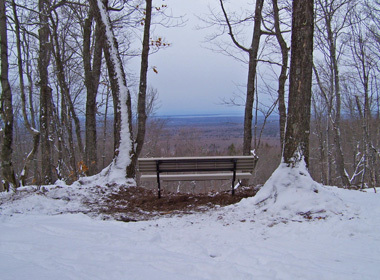 In the fall of 2012, trees were cleared in a sufficient arc and depth to clearly see Lake Superior to the North, and the bench was placed facing the lake. 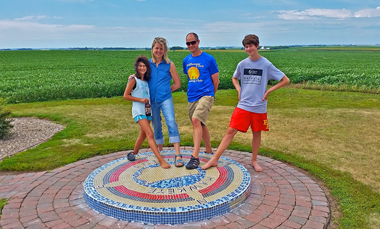 The Foundation has supplied the local chamber of commerce in L’Anse with decals, magnets, and stickers for visiting tourists. 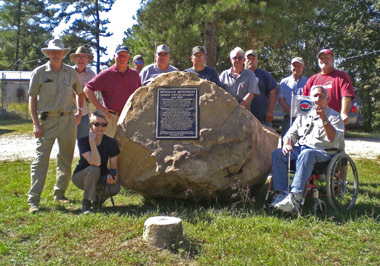 The Highpointers Foundation worked with the USFS and local historical societies to renovate the famous plaque imbedded in the summit boulder on Eagle Mountain. 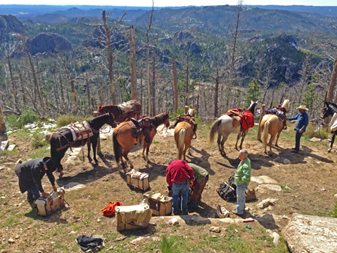 This operation took considerable skill on the part of Highpointer Club volunteers. 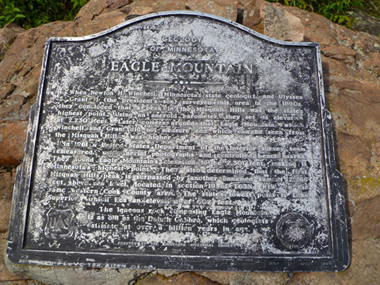 The original installation company, still in business, advised on how to clean the plaque and remove about 60 years worth of decay and erosion. 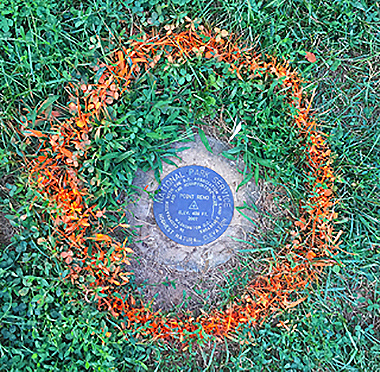 The plaque looked like new at the end of the summer of 2012. Foundation funds were used to complete this expensive work. 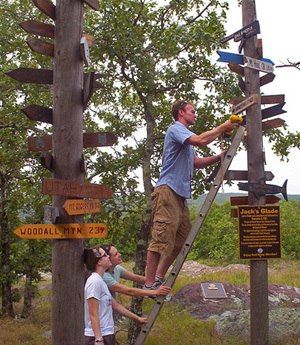 In 2011, the Foundation procured a large 50 Flags Poster commemorating the tragic events of September 11, 2001, and shipped it to the USFS Tofte Ranger Station near Eagle Mountain, MN. 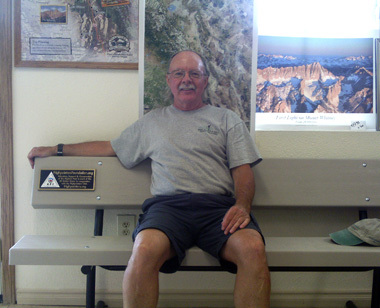 The poster is on display in the ranger station visitor center for passersby to view. These posters were given to the owners and managers of all 50 state highpoints in 2002 on the anniversary of 9/11. The poster for Minnesota was misplaced, and the Foundation was able to come through with a replacement. 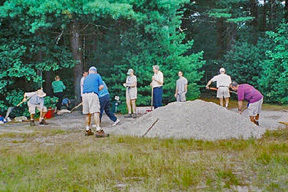 The Highpointers Foundation provided funds for a large boulder to be placed inside the small road loop at the very top of the highpoint. 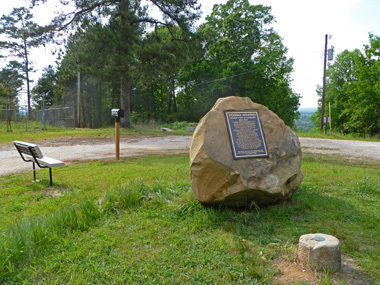 This boulder was obtained from 50 miles away in Alabama, transported to the highpoint, and set in place. A brass plaque was inset, which describes the history of the area. 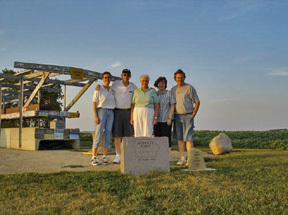 The plaque honors the landowners, the extended Brown family, for allowing access to visitors. 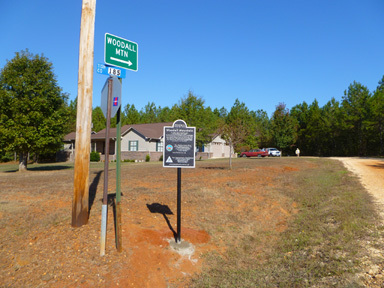 Another sign was erected at the bottom of the approach road, at the intersection with the county road, which leads visitors in the correct direction. The signs were unveiled at the Club convention at MS-10, the acronym for the Mississippi Convention held in October 2010. Close to 200 enthusiastic highpointers watched as Foundation Director Gary White unveiled the plaque, with the Brown family watching. at the newly renovated Mississippi highpoint. 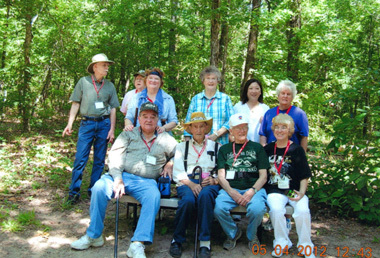 The Highpointers Foundation is working to make additional improvements at the Jakk Longacre Glade. 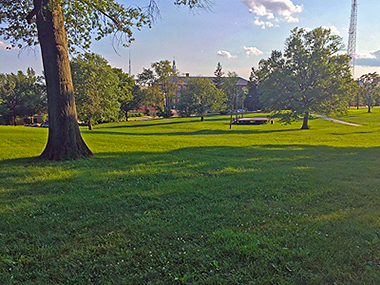 This pleasant viewpoint was donated by Lori Longacre, daughter of the late Jack “Guru Jakk” Longacre, who was an inspiration to all highpointers until his death in 2002. 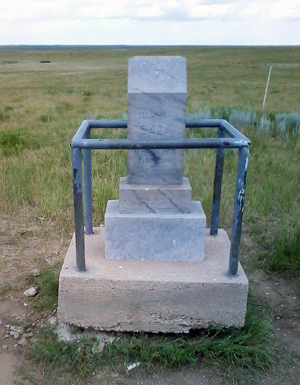 Jakk lived near this point, and was proud to be the highest resident of the state of Missouri. 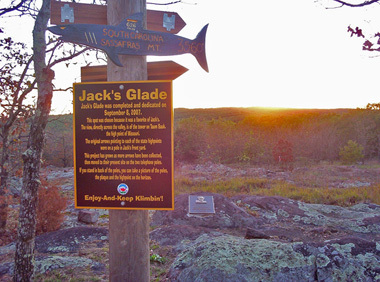 His home was about two miles from the summit of Taum Sauk Mountain along County Road CC. Jakk frequently walked across the road and out to this viewpoint, occasionally even sleeping on an outcrop to watch the stars from there. 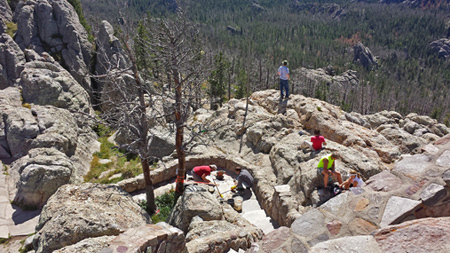 The Club created a parking lot here, and improved a path to the viewpoint. 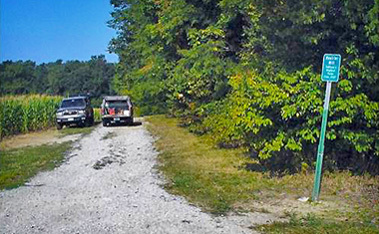 Extensive surveying was required to legally accept this property, all provided by Club volunteers. 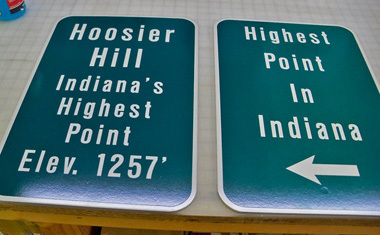 Sign posts have been erected, displaying custom signs for each of the other 49 states, depicting the distance and direction to each highpoint. 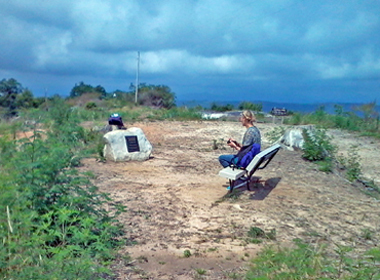 The Foundation provided a bench for visitors, which was placed in 2012. 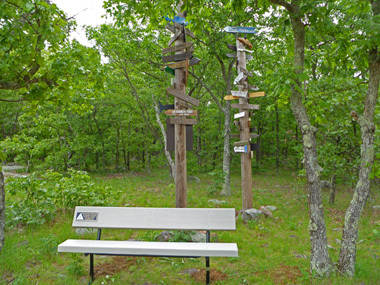 Visitors to Taum Sauk can stop here en route to the highpoint for a picnic lunch. 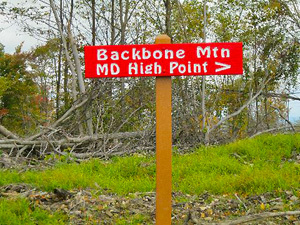 A replacement sign was installed in 2016. 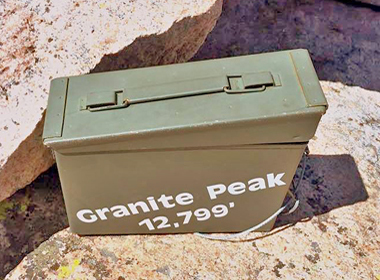 An ammo can register was securely placed on the summit in 2013 with the assistance of Jackson Hole Mountain Guides. 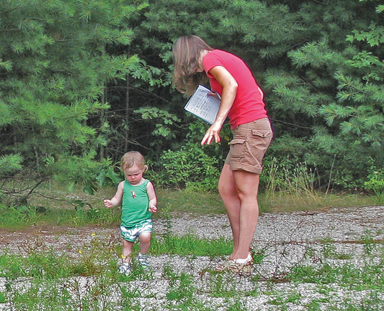 The dirt lane leading to Panorama Point became rutted in inclement weather, and the landowners asked visitors to refrain from driving around the mud puddles. The Highpointers Foundation provided funds for several loads of gravel to help resolve this problem, and this work is still in progress. 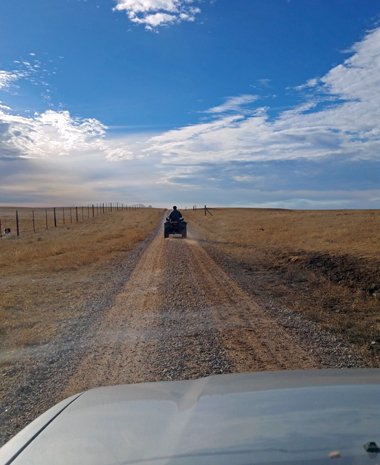 In the summer of 2016, the Foundation commited to enabling the 1.2 mile access road to be completely bladed, and the dozen low spots filled with gravel and recycled crushed concrete. This should reduce the annual snow and mud closure days from over 40 to less than 10. In 2018, the road repairs were completed to the summit. 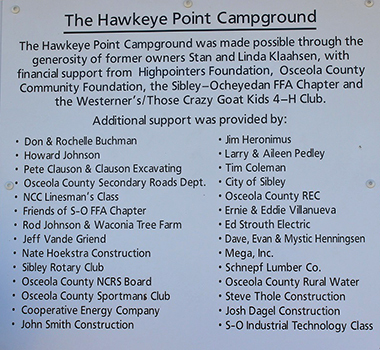 The Foundation also provided funds for several signs along the gravel county roads leading to the highpoint. 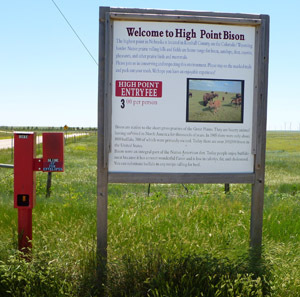 These signs assist visitors in their travel to the highpoint and, for safety, warn of the bison herd in the area. 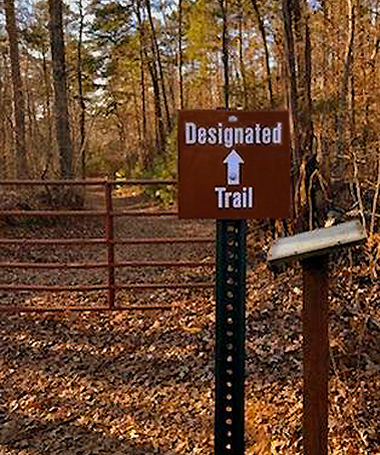 The signage also indicates proper conservation of the access roads and asks visitors to respect the owner’s request for a nominal donation upon arrival. 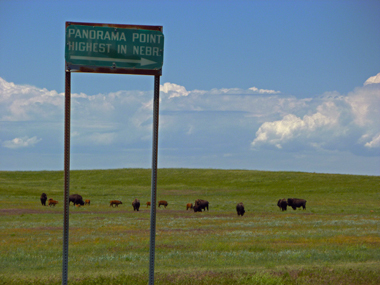 It is too dangerous for visitors to walk the last mile to Panorama Point if the bison herd is in the pasture near the highpoint, so the Foundation is working with the landowners to make improvements to the cattle guard encountered en route to Panorama Point. 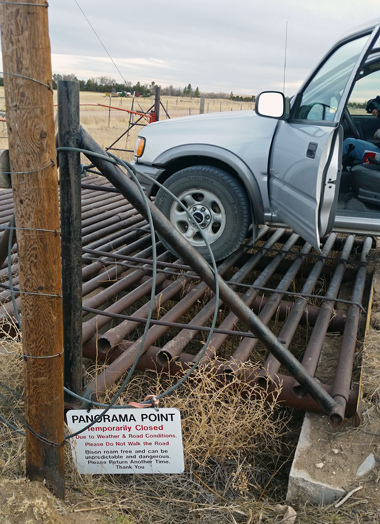 Bison can jump a single cattle guard, and a double cattle guard is needed. 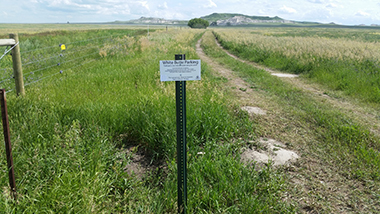 To completely resolve this issue, the Foundation is negotiating for a tall bison fence around the access road and the highpoint. 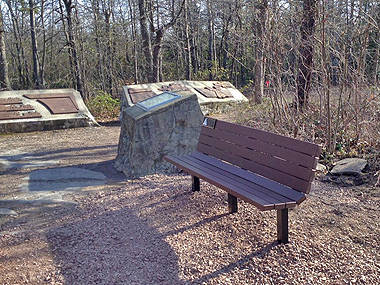 In 2014, the Foundation placed a plaque and bench at Panorama Point. 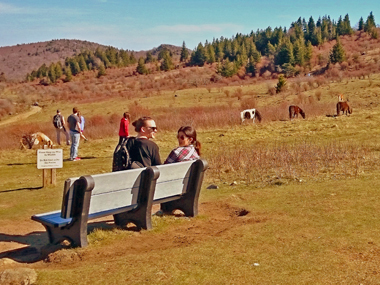 The bench faces southwest so vistors can enjoy the view of the distant mountains. The first mile of the road has been improved. 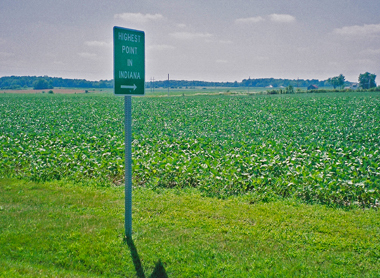 After a mile, the road turns north. 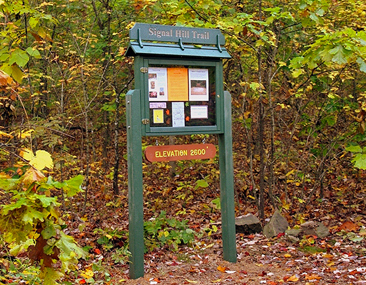 The old sign at the turn. Note the bison. 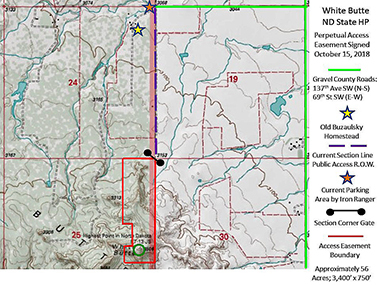 The NE highpoint area with new gravel. 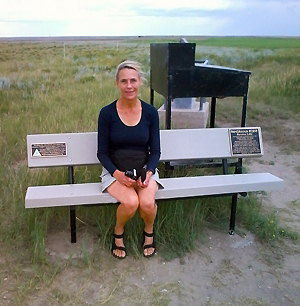 Lidy Van Schie on the NE summit area bench. 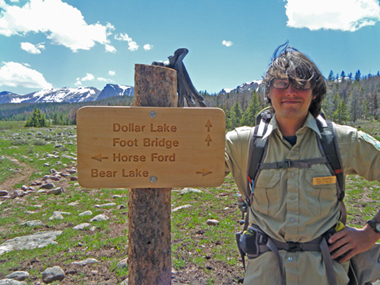 The Highpointers Foundation has provided funds for three trail registers. 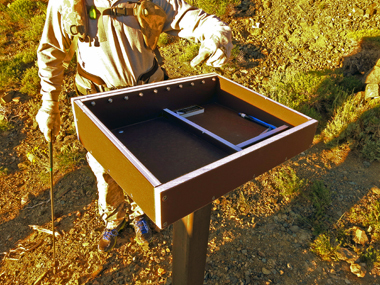 The USFS installed the registers at the Trail Canyon, Queen Mine, and Middle Canyon Trailheads in 2013. 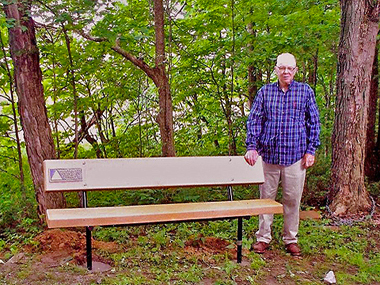 The Highpointers Foundation has provided funds for a bench. The bench lies in a strategic spot halfway up the paved walkway to provide a rest for slower visitors. on the New Jersey Bench. 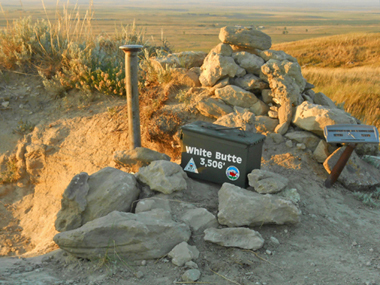 provides permanent public access to the North Dakota Highpoint. 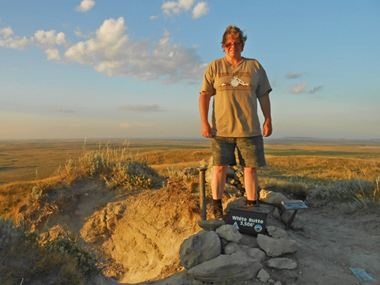 at the North Dakota Highpoint. 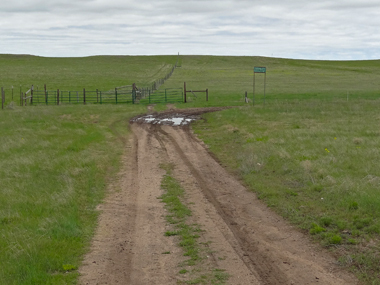 The road out to the actual trailhead. Valerie Naylor with the new iron ranger. 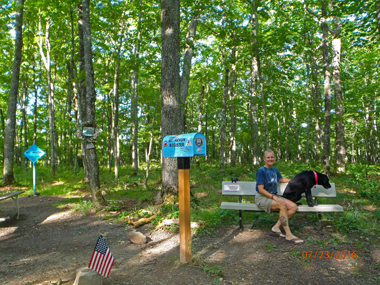 The old mailbox is on the right. 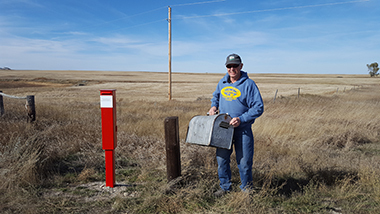 Dave Covill collecting the old mailbox. It was removed from the parking area. 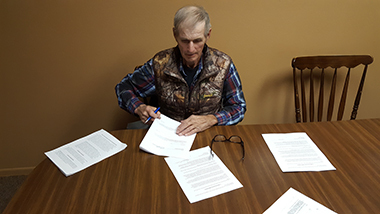 Daryle signing the easement agreement. 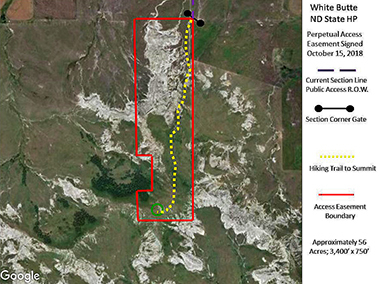 Overview of the Access Easement. 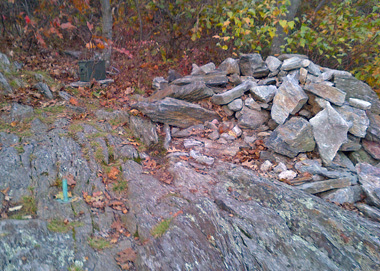 Closeup of the Access Easement. Aerial View of the Access Easement. Dave Covill at the summit after the signing. 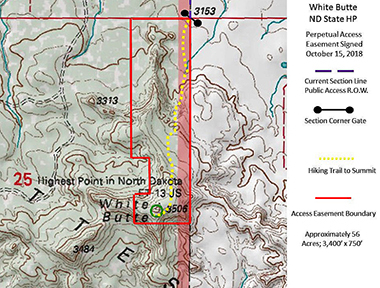 To view the ND Access Easement, click here. 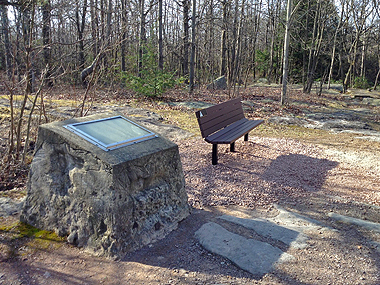 A sponsored bench was placed near the highpoint in 2017. 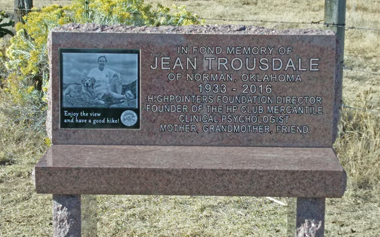 A custom granite bench in memory of Jean Trousdale was placed at the trailhead in 2016. Many highpointers and family attended a memorial service in October, 2016. 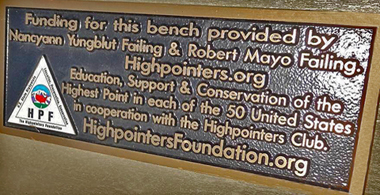 The Highpointers Foundation has provided funds for a bench. 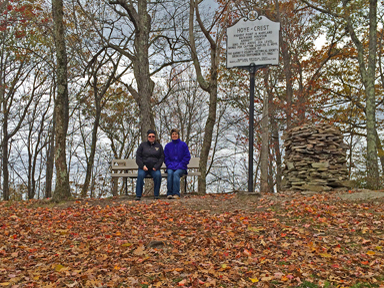 The bench lies at the edge of the summit clearing. 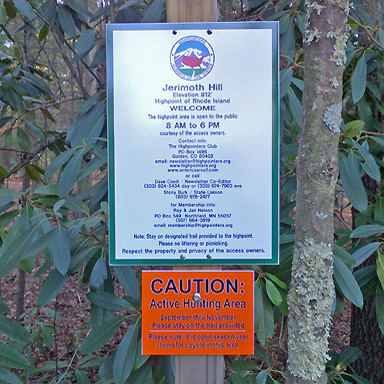 The Highpointers Foundation and the Good Guys and Gals Fund, provided funds for signage at Jerimoth Hill from 1999 through 2012. 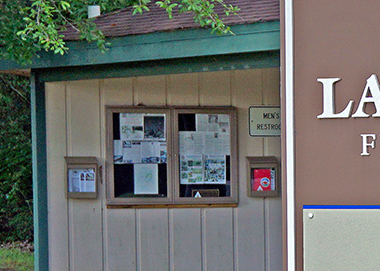 The signs directed visitors to only come on Club-approved and owner-sanctioned Open Access Dates. 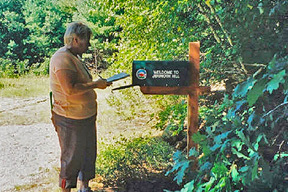 In 2005, the Good Guys and Gals Fund also provided funds for materials for a trail to the highpoint, signs, and a mailbox register. 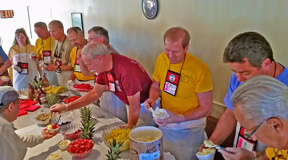 There was an improvement weekend immediately after the NH-05 convention on Labor Day weekend, and close to 100 people helped over two days. 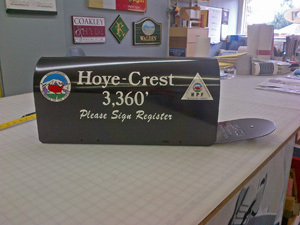 A replacement register and improved signs were added in 2012. 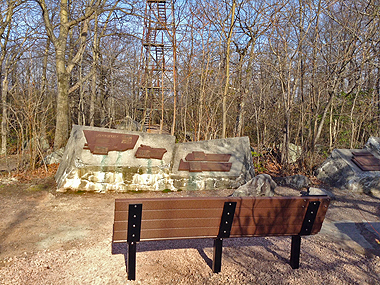 Rhode Island has a family friendly Highpoint! 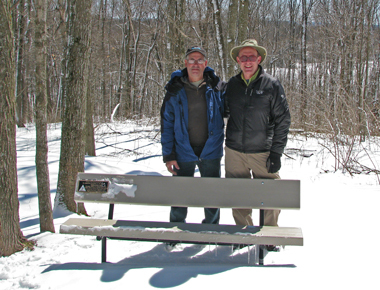 The Highpointers Foundation provided a bench at the recently renovated summit clearing. 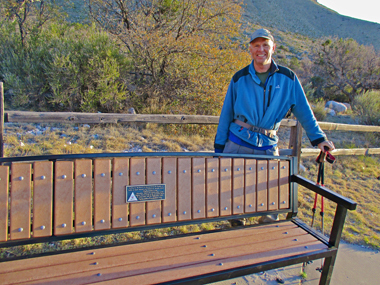 Highpointer Steve Riddle funded the bench in honor of his 40-year anniversary with his wife Kathy. 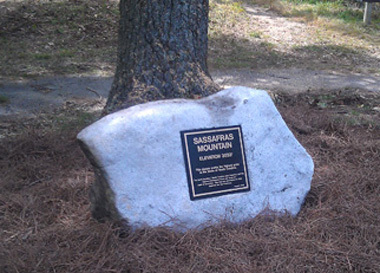 The Foundation provided a large rock with a bronze plaque to mark the location of the highpoint. 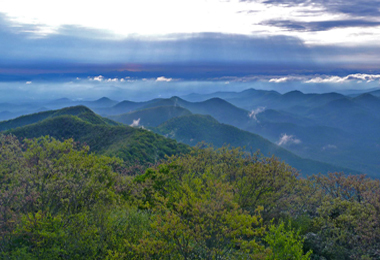 The Highpointers Foundation is working with the South Carolina Department of Natural Resources to renovate the summit area of Sassafras Mountain. 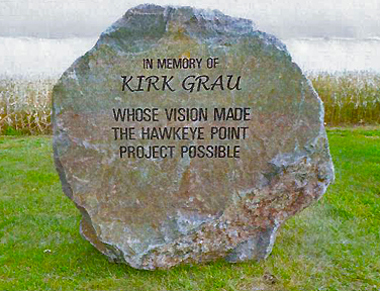 The Foundation has commited $3,000 so far to this project, and has enabled large paver stones at the new observation platform being built in 2018. 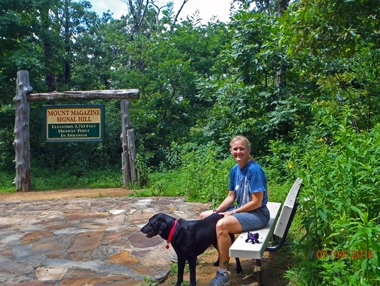 Lidy Van Schie at the Sassafras summit area. 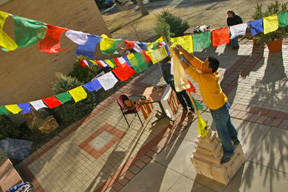 The Highpointers Foundation provided funding for labor and materials to help with a major tower building reconstruction. 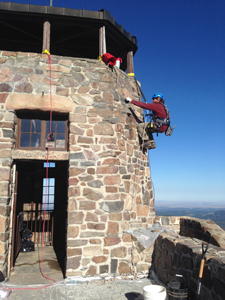 The old stone lookout was deterioting badly and in danger of being closed. Now, flagstone steps have been replaced as well as windows and doors. 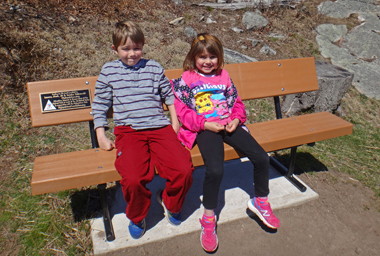 We also funded a beautiful stone bench halfway up the trail at the boundary of state and federal land. 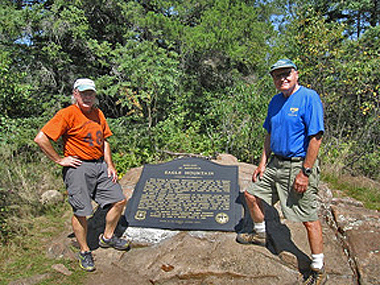 Summit hikers can pause here with a view of the summit, and this point could be an end goal for some visitors who would be challenged by the rough wilderness hike to the summit. 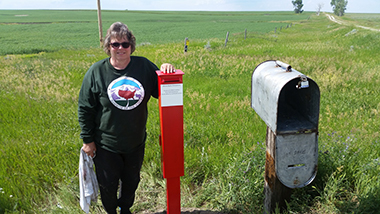 Additional interpretive signs will be installed in 2018, funded by the Foundation. We have created a second stone bench, and that installation will take place in Spring 2018. 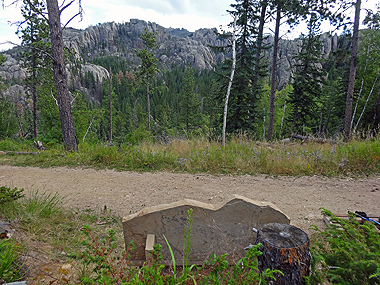 This bench is along the alternate Trail #4 to the summit, near Little Devils Tower and the Cathedral Spires, with a nice view of the summit and stone tower. 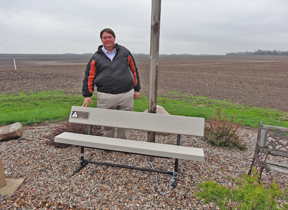 Craig Renkert enjoying the new SD bench. now he’s visiting easier state summits. 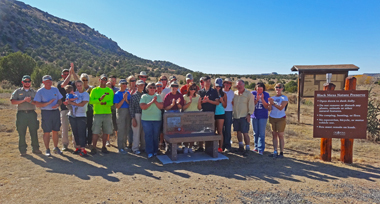 The Highpointers Foundation has provided a bench. 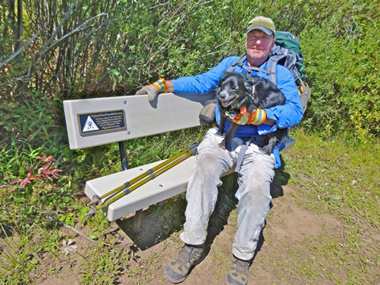 It was installed near the visitor center at the trailhead in 2014. 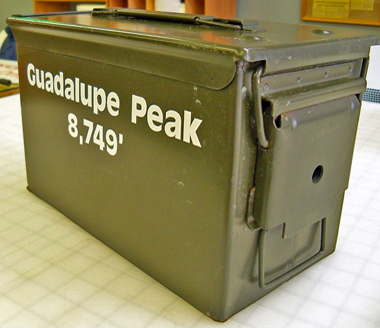 An ammo box register was placed on the summit of Guadalupe Peak in 2012, and replaced in 2016 after damage to the hinges was discovered. 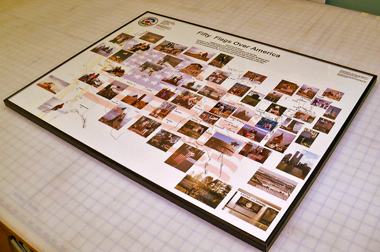 The Highpointers Foundation provided funds for a large framed 50 Flags Poster, commemorating the events of September 11, 2001, which was delivered to the USFS Ranger District office in Mountain View, WY. This office administers the northern approach to Kings Peak, a.k.a. 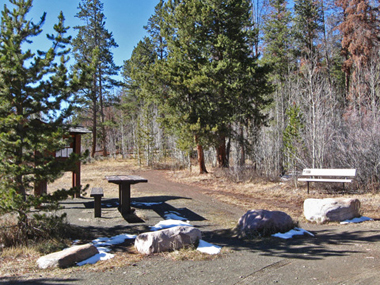 the Henrys Fork Trailhead. 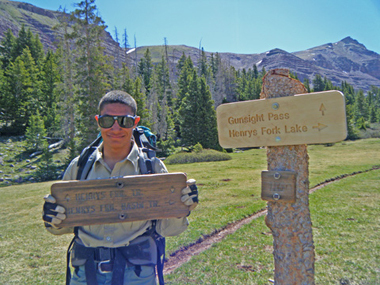 The US Forest Service is well aware of the many Highpointers who pass through and inquire about Kings Peak, and they are a strong ally to the highpointing hobby. 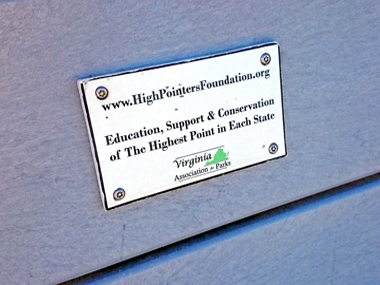 This was the first collaboration between the Highpointers Foundation and a federal ownership administration, the USFS, for the benefit of a highpoint. Lorie is on the left, Whitney on the right. 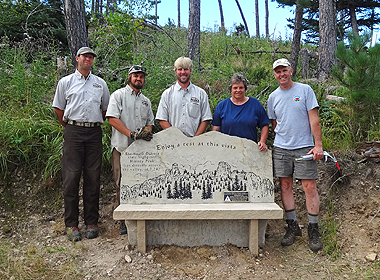 With funds from the Highpointers Foundation, a bench was added to the Henry’s Fork Trailhead north of King’s Peak in 2012. 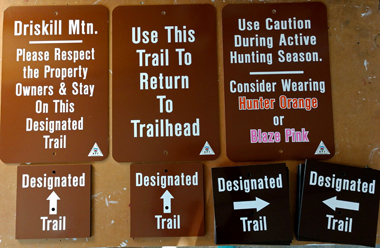 Wilderness trail signs were placed in 2013 and 2014 to replace worn out signs that had served for decades, and again in 2017. 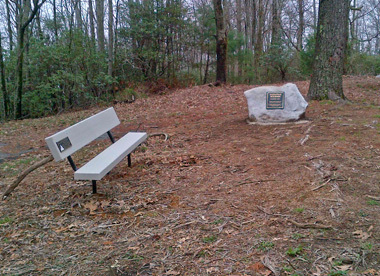 The Highpointers Foundation provided funds for a bench located just inside the VA State Park boundary. 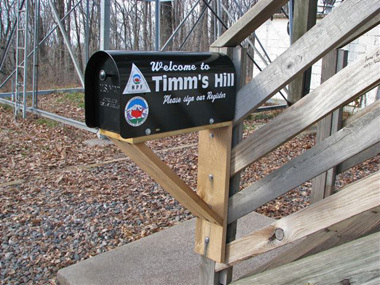 The Highpointers Foundation provided funds for a mailbox register for visitors to sign when hiking Timm’s Hill. 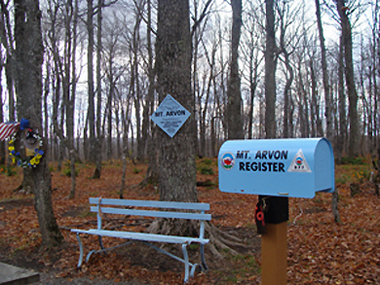 A register mailbox was placed in August 2007. 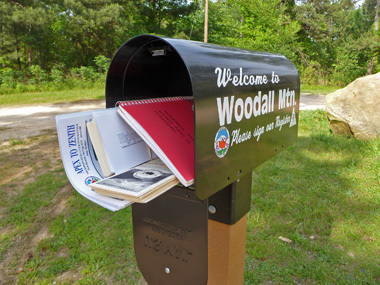 A replacement mailbox was needed and placed in 2012. 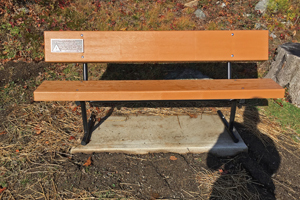 A bench was also installed in 2012, along with numerous signs. 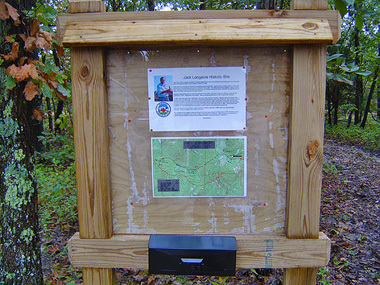 The original wooden trail map signs were decaying, and were replaced in 2012, created entirely in vinyl plastic. 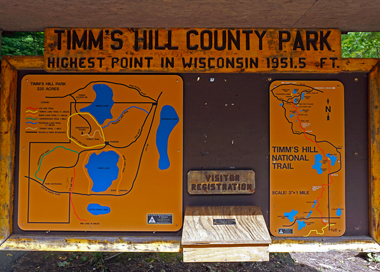 Wisconsin HP club liaisons Doug and Mary Urban visited Timm’s Hill to admire the new register and bench. 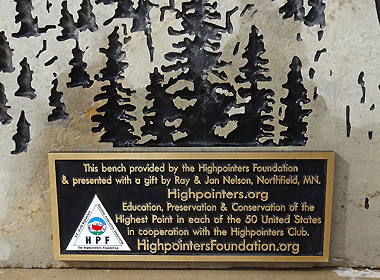 The Highpointers Foundation has raised over $170,000, and has invested more than $120,000 at 31 US state highpoints, the Bradford Washburn American Mountaineering Museum in Golden, Colorado, and for the USA-wide program of Highpoints movies. AZ, CO, CT, DC, ID, IL, IN, KS, ND, NE, NH, OH, OK, SC, SD, and TX. 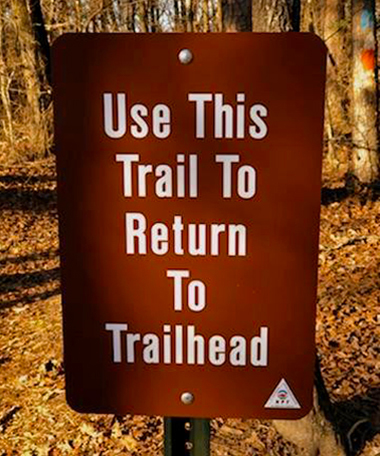 to provide an informational sign with directions to the hard-to-find benchmark. 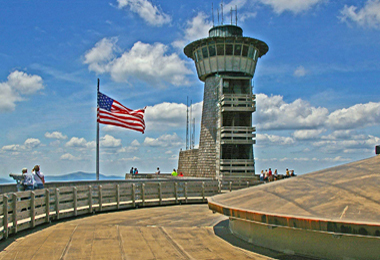 South Carolina – Sassafras Mountain – We are participating with summit observation tower efforts, including putting a paver stone inside the tower. 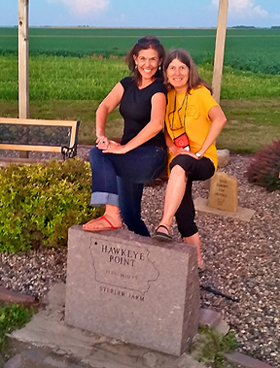 The Highpointers Foundation Board of Directors always welcomes ideas for other projects at state highpoints.